Japanese confectionery can be divided into Yogashi (western-style confectionery) and Wagashi (Japanese-style confectionery). It is not uncommon for fans of animated and live action films to visit locations featured in such stories. With the development of social networks it is now possible even for complete strangers to easily share information with one another. Did you know there is masking tape with cute and colorful patterns? Beyond the drab masking tape used by painters in their work, new decorative tape is available from Japan. How would you like to experience the thrill of being the main character of a video game or novel? You get that thrill in escape game events where you get hands-on in puzzle solving. Projection mapping has colored buildings and open spaces brilliantly at festivals and events around the world. Lucky bags are a feature of the beginning of a new year in Japan. A lucky bag is a sealed package containing many goods, with the bag offered for sale at a lower price than the total value of the goods in it. They have been very popular among Japanese people as New Year merchandise. If you visit Japan, you might well see women who are stylishly dressed while enjoying running, mountain climbing, or fishing. 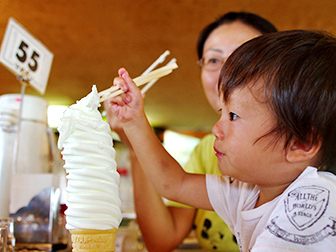 Soft Serve ice cream is sold in numerous unique flavors at tourist sites throughout Japan from northernmost Hokkaido to southernmost Okinawa. Anison is a word combination of anime (English word for Japanese animation) and song, and is used in Japan as the word for the theme songs and incidental songs used in an animated productions. If you walk around a town in Japan, you will notice that there are vending machines packed with sense of enjoyment. With its features that harmonize seamlessly with any dish, the use of Japanese sake is rapidly spreading among famous hotels and long-established restaurants overseas. A half century after the start of TV animation, the focus will be on the up-and-coming young film creators who will drive the Japanese animation industry. Japanese favorite Curry-rice aims to break new ground as the "National Dish", mixed with various ingredients. Michi-no-Eki, rest areas lying along normal roads, are popular spots used by more than 500milion people a year. These spots focus on tourist information and sales of locally produced food, also, many of them are turning into tourist hubs, with hot springs and workshop practice sessions. One by one, traditional Japanese cake ”Wagashi” sets a seasonal scene. While the skill of wagashi craftsmen has been handed down throughout the ages and is much cherished, wagashi have also risen to provide shining examples of new challenges. In the spring of 2013, Kabuki-za has been revived with an entire renewal.While significantly leaving the vestiges of the theater in the past, such as the large tiled roof, the theater has been wonderfully modernized with a high rise building linked to the establishment. Kumamon, a mascot PR character of Kumamoto prefecture in the Kyushu region of Japan, is now "Japan's most popular bear". In its birthplace of Japan, karaoke is evolving further, with more advanced karaoke machines harnessing web technologies to broaden the scope for fun, including dubbing of anime scenes and singing duets with strangers. Ekiben (train bento boxes) sold on trains or at stations are packed with the sensitivity, creativity and technology of Japanese people as well as with regional specialties across Japan. In Japan, novelty cafes are popular and constantly opening up because of the diverse nature of consumer demand. These include cafes where you can watch cats and rabbits, or where you can enjoy rakugo storytelling or model railways. Restaurants in Japan often display tasty-looking food in their windows. These food models are replicas, peculiar to Japan, and surprisingly realistic, produced by expert craftsmen with sophisticated techniques. In Japan, people enjoy hot summer in a cool way with wisdom and ingenuity such as the sound of furin (a tiny wind-bell), watching fireworks or dining on the river. Akihabara (also known as Akiba for short) is about synonymous with Japanese subculture and hallowed ground for anime and manga comics and character figures. And there are a number of such spots in Japan other than Akiba. In Japan there are countless manga kissa, or manga cafes, that cater to customers seeking to refresh with a comic book or wanting some downtime. In capturing the simple details of life, modern anime is finding a new audience. In Japan these days, young women—always on the leading edge of pop culture—have taken nail art to a new dimension, turning their nails into fascinating, virtual objets d'art. An ancient historical period of warring Japanese generals has taken the country by storm, inspiring everything from entertainment to tourism. And it's the young women who have been fueling this boom! Video sharing sites are enabling new ways of communicating with others and creating a unique media experience online. Giving young women a chance to see themselves pictured with ideal cuteness and beauty, purikura photo booths are now offering even more options as they continue to evolve. Knitting, embroidery, cord braiding and other such crafts are reworking fashion, café culture and contemporary art. Japan has long led the world in cutting-edge advances in mobile phone technology and features—some of which are just beginning to appear in other advanced nations. From its simple origins, ramen has undergone a spectacular evolution to give a stunning variety to be savored today. Today, growing numbers of anime and manga feature specific locations and real buildings in detail, making them popular pilgrimage spots for fans. The personification phenomenon has entered the mainstream of Japanese culture. Cute, humanlike characters have become a vital part of popular culture and a key element in corporate and government public relations. What has enabled Japan to produce one high-quality manga hit after another? We take a look behind the scenes at some of the factors that have made Japanese manga such a phenomenon around the world.